Told ya. We're back up to 80 degree temps in So. CA. The day started off cold and windy but warmed up by early afternoon. I suppose I shouldn't be complaining. I could be shoveling snow in some other state and it's not a pretty picture in my head. What is obvious though is that we're getting shorter days now with the arrival of fall and soon, winter. This has forced me to cook dinner earlier than ever so that I would still have enough sunlight to take some decently bright pictures. In my last post, I had to resort to snapping pics of our dinner under the harsh yellow lighting in our dining area. In the end, I guess they didn't end up looking too bad but that was due to a ton of tweaking in Lightroom on my part. Natural sunlight is still my preferred choice of lighting so with that in mind, I was in the kitchen working on dinner as early as 4:30 p.m. today. 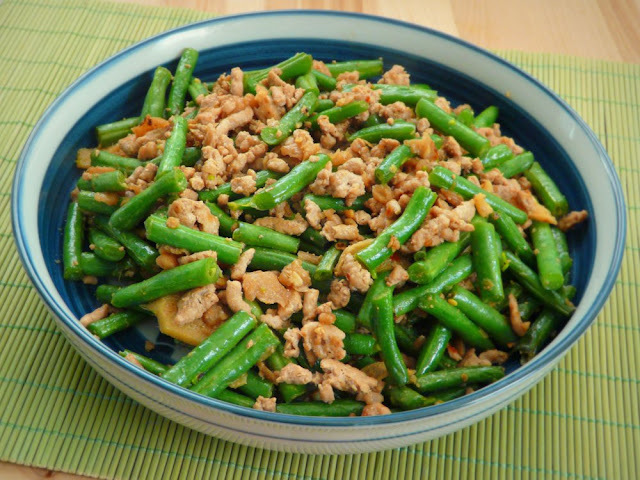 Green beans are a favorite in my household when it comes to vegetables, whether Asian or American style. If I need a vegetable dish for dinner, I can't go wrong with green beans. Tonight I served up a Chinese style dinner with this green bean and ground pork stir fry, braised tofu and a simple cucumber salad. I had dinner on the table by 5:30. Quick and easy...my cooking style of choice! 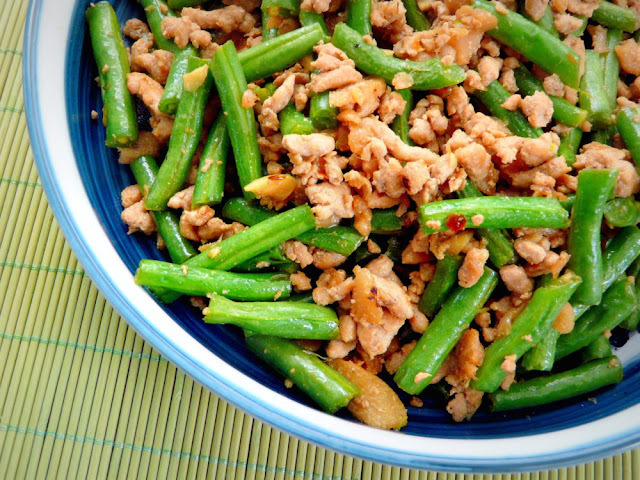 This is a spicy, Szechuan style green bean stir fry so it calls for preserved dried radish which is readily available from any Chinese grocery store. I chose not to dry-fry the green beans this time in order to limit the amount of oil used in the dish and also to omit an extra step due to lack of time. Dry-frying is a method in which the green beans are first deep fried to achieve a wrinkly and puckered texture on the outside. See my other green bean post on how to dry-fry green beans. Heat the oil in a wok or large frying pan. When the oil begins to smoke, saute the garlic and ginger for a few minutes until fragrant. Make sure the garlic does not burn. Add the ground pork to the pan and break apart with spatula. Brown the ground pork and cook until it is no longer pink. Add the red pepper flakes, soy sauce, preserved dried radish and green beans to the pan then reduce heat to medium. Cover with a lid and cook for about 5 to 6 minutes, or until the green beans have become crisp tender. Raise the heat back to high and allow any liquid in the pan to evaporate. Transfer to a dish and serve hot with steamed rice. at the Chinese grocery store next to the Asian pickles. cautiously. 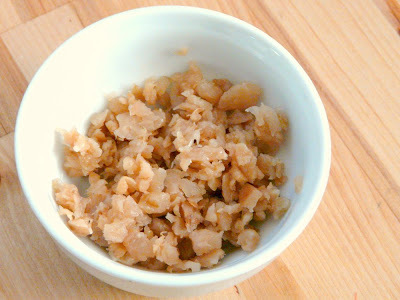 Preserved dried radish can also be eaten with congee. 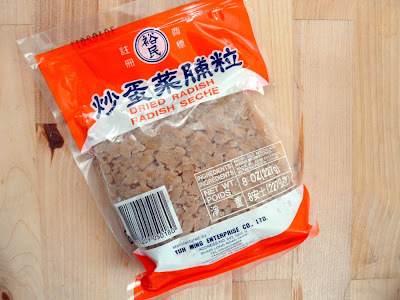 Great with steamed rice or plain congee!